Today is within the Octave of Christmas and so we celebrate each of these days as though it were Christmas day itself. During this week there are several worthwhile Feast Days worth commenting on. Today, for example, is the optional memorial for Saint Thomas Becket. He was King Henry II’s Chancellor and friend in 12th century England and after being appointed as the Archbishop of Canterbury, he was murdered after alienating the King. 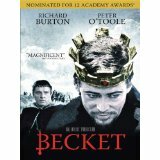 I decided that in tribute I would watch the movie “Becket” starring Peter O’Toole and Richard Burton. Made in 1964, it was nominated for 12 Academy Awards!